At the moment i doesn't get any code completion support from RubyMine. When I wrote code before an typed UIWindow.al the there were hints for codecompletion, but now there is nothing. What can I do to get my well loved code completion back? I uninstalled Xcode 5 and reinstalled Xcode 4.6 again and the Code Completion for iOS was still missing. Completion in RubyMine works well now. code completion in RubyMotion project isn't working again. What could be the reason? There is no Code Completion support, either for iOs API nor my local variables. Then I created a new emty Project in Rubymine and created a new dummy.rb file. The local variables could be used with Code Completion. Please help to get the code completion in RubyMotion projects running again. could you please try our latest EAP build (http://confluence.jetbrains.com/display/RUBYDEV/RubyMine+EAP) to see if the problem is fixed there? thanks for the fast response. 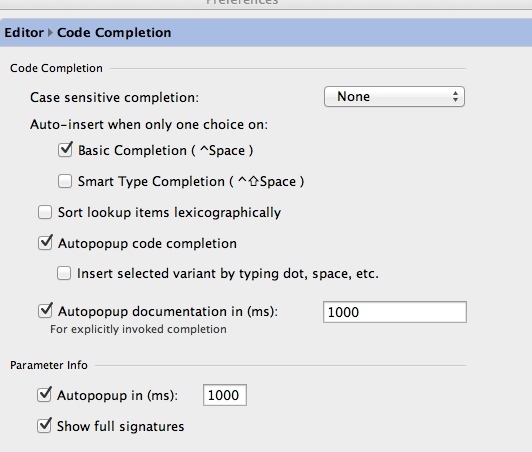 The code completion works with the latest RubyMine EAP build. and have found a new unexpected behaviour. After two or three crashes of Rubymine while running an IOS app on the simulator the Code Completion works now only after the ^+space keystroke. Before the crashes the Code Completion makes automatically suggestions during writing down the code. What could I do to get the code completion automatically shown? do you have any news or ideas to this problem?